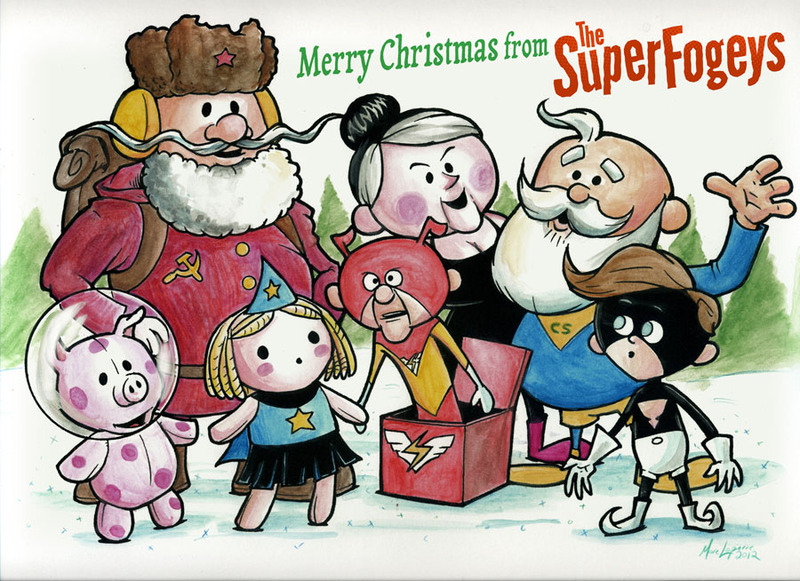 SuperFogeys - Merry Christmas From The SuperFogeys! Hey, Merry Christmas everyone! Can you believe the above piece? I ask Marc very late last week if there was anything he might be able to do for Christmas and he came up with this in record time. I’m so over the moon in love with it. My wife is, too. She’s determined to get a nice print of it and hang it up on our wall for future Christmases. Needless to say, we WILL be doing that. I hope you’ve had as good a year as I have, and a better year than the Fogeys had. I’ll admit, 2011 was pretty rough in a lot of ways, but 2012 has been a banner year for both personally and professionally for me.Which isn’t to say that there haven’t been dark moments. I also saw a few of my lowest lows this year. Stuff I’m still dealing with, actually, but as I look back it’s hard to let that stuff weigh me down when there’s so much good. I believe there’s more good than bad in the world generally, it can just be hard to see it sometimes. Please forgive the moment of reflection. This time of year does it to me. I hope all of you have a wonderful Christmas/Hannukah/Holidays/End of year. See you on January 7th! I know I hardly ever comment, but this is absolutely incredible! GREAT job, Marc! I want a print of this! You should offer one on the site. And, Merry Christmas to you all! Marc. We don’t pay you enough.